For large-group training on inner-ear-examinations, this tool provides an ideal solution. 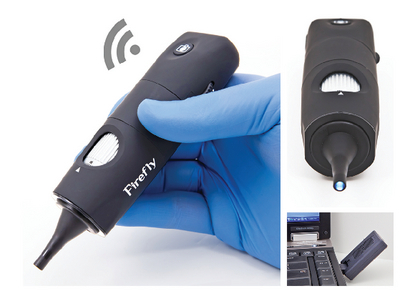 This digital otoscope captures live image and video and wirelessly transmits to up to four PCs simultaneously in real time. With variable magnification of 15x to 150x digitally, or 15x to 50x optically, this camera scope observes and records images at 30 frames per second. Bright, user-adjustable LEDs are attached to the head, and a built-in snapshot button allows users to save captured images for further study and analysis. Multi-layered glass lenses and rugged industrialized construction guarantee dependable results. A built-in 800mAh battery provides long-lasting use for hours of lab demonstration. Ordering information: This kit includes a FireflyPro Software CD with a scalable window, zoom, freeze, resolution, rotate, and flip tools. It includes disposable specula: three each of 3 mm, 4 mm, and 5 mm dia. and a USB cable, AC outlet charger, velvet carrying case, user manual on CD, and one-year manufacturer's warranty. USB Interface is 1.1/2.0 and above. The system requirements are Windows 7, Vista, and XP.